Epic really is the only way to describe Thursday 21 June in the UK, with four 1,000km flights and numerous other outstanding tasks. Read about Epic Thursday in the Aug/Sept issue of S&G, which also has an overview of weather apps to help you spot ‘the day’. 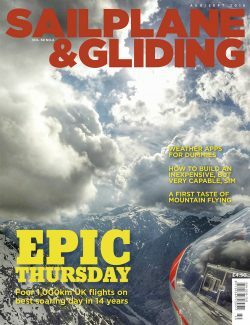 Plus, there are top tips on building an inexpensive, but capable, glider simulator for those days when the weather is less than ideal. Like buses, you wait ages for one to come along (14 years in this case) and then four come along on the same day! We’re talking about the four 1,000km UK flights on Epic Thursday, a day that saw 76,645km logged on the Ladder. This issue has reports and quotes from some of the pilots behind these impressive achievements and there will be more to come in the next S&G. You don’t have to fly 1,000km to be justifiably proud of your flight. Neil Croxford decided the time had come to leave the comfort and security of the airfield. With the help of a feathered friend, Neil was delighted to achieve the goal of his first 50km flight. Bob Symons was also proud of his achievement, learning to fly in the Alps during an Aim Higher course in Sisteron, France – an experience that he says couldn’t be bettered. When choosing ‘the right day’ you will probably refer to weather apps aimed at helping pilots understand conditions. But which one should you choose? This issue features an overview of RASP, TopMeteo and the new kid on the block, SkySight. In the last issue, David Innes explains how we can use glider simulators to enhance the learning experience. This time David shares top tips for clubs on building a glider simulator that doesn’t cost the earth yet is very capable. 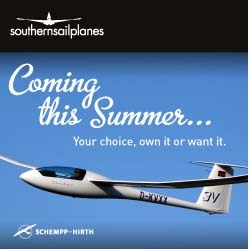 Also in this issue: Schleicher introduces the AS 33. In the first of a new series on Aim Higher coaching, Tony Cronshaw asks Kevin Atkinson how to climb quickly in thermals. 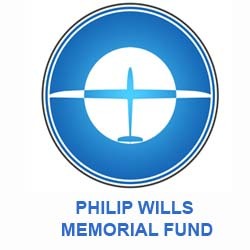 Gliders featured in Shuttleworth’s celebration of the RAF Centenary, reports David Rhys-Jones. Liz Sparrow reports on a new women coaching programme. Mike Fox recalls a memorable landout from many years ago and asks if you can better this tale. Ebenezer Grimshaw breaks taboos, dispels myths and restores reality for newbies. Alison Randle explores the benefits of bite-sized instructing. Pete Stratten gives an update on airspace modernisation. Joey Beard reports on the Juniors Summer Series. There are book reviews of Skybound and Why does it fly? Andrew Jarvis reports on the first VGC national rally in the north. Plus many more of your stunning images in the Gallery pages. Banking on a fast climb? Scream if you wanna go faster, or just further! Liz Sparrow reports on a new women coaching programme.